I hate to say it, but it's back-to-school time for many of our younglings. Take heed, my friends, since The Children's Place is having a one-day summer clearance sale with discounts up to 75% OFF. Bonus: Every order comes with FREE shipping! There are hundreds of clothes, shoes, and accessories to choose from. Grab some warm-weather styles or start stocking up for the fall and winter seasons. Remember to plan ahead, because those kids grow like weeds. 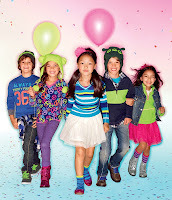 Click here to view the sale at The Children's Place.